The Greek drachma was originally defined as 1/6000th of a talent of silver (a talent was a unit of weight equal to about 56 pounds). But Solon, the leader of Athens at the beginning of the sixth century B.C., ordered the minting of 6,300 one-drachma coins from each talent of silver, an instant profit of 5 percent. (In fairness, it should be pointed out that setting the face value of the coinage slightly above the bullion value also helped safeguard the money supply, because people would not be tempted to melt down the coins for the metal content.) The profit from minting coins with a face value greater than the bullion value is called seigniorage, a word that clearly implies the sovereign nature of the power to coin money. But if the money supply soon came under the exclusive jurisdiction of the sovereign, the sovereign, all too often, became the money supply’s greatest threat. For while governments possess the power to coin money, they have always been hard-pressed to pay their bills proof, if any were needed, that money and wealth are by no means the same thing. Greek drachma of Aegina. Obverse: Land Chelone / Reverse: ΑΙΓ(INA) and dolphin. 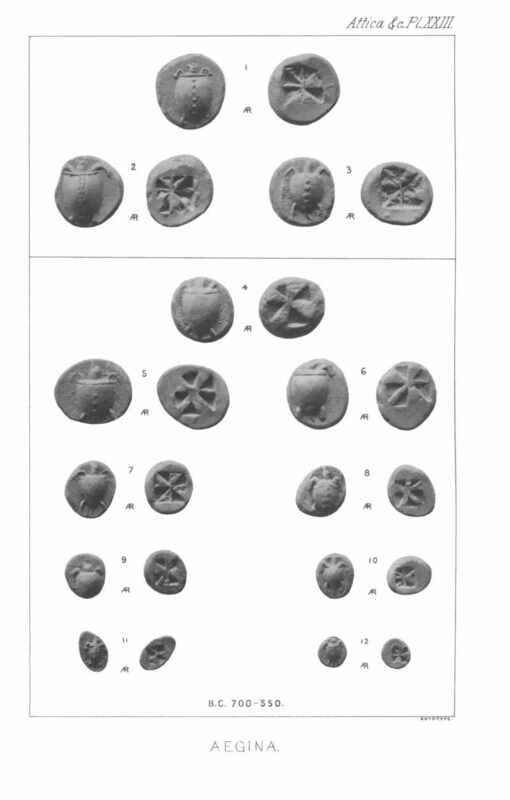 The oldest Aegina Chelonecoins depicted sea turtles and were minted ca. 700-550 BC. The name drachma is derived from the verb δράσσομαι (drássomai, “to grasp”). It is believed that the same word with the meaning of “handful” or “handle” is found in Linear B tablets of the Mycenean Pylos. Initially a drachma was a fistful (a “grasp”) of six oboloí or obeloí(metal sticks, literally “spits“) used as a form of currency as early as 1100 BC and being literally a form of “bullion”: bronze, copper, or iron ingots denominated by weight. A hoard of over 150 rod-shaped obeloi were uncovered at Heraion of Argos in Peloponnese. Six of them are displayed at the Numismatic Museum of Athens. It was the standard unit of silver coinage at most ancient Greek and Roman mints, and the name ‘obol’ was used to describe a coin that was one-sixth of a drachma. The notion that “drachma” derived from the word for fistful was recorded by Herakleides of Pontos (387-312 BC) who was informed by the priests of Heraion that Pheidon, king of Argos, dedicated rod-shaped obeloi to Heraion. Similar information about Pheidon’s obeloi was also recorded at the Parian Chronicle. Ancient Greek coins seldom had official names. Each city would mint its own and have them stamped with recognizable symbols of the city, along with suitable inscriptions, and they would often be referred to either by the name of the city or of the image depicted (e.g. the Aeginetan “turtles”). The exact exchange value of each was determined by the quantity and quality of the metal, which reflected on the reputation of each mint. The 5th century BC Athenian tetradrachm (“four drachma”) coin was perhaps the most widely used coin in the Greek world prior to the time of Alexander the Great (along with the Corinthian stater). 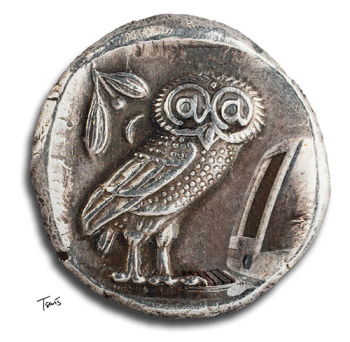 It featured the helmeted profile bust of Athena on the obverse (front) and an owl on the reverse (back). In daily use they were called γλαῦκες glaukes (owls), hence the proverb Γλαῦκ’ Ἀθήναζε, ‘an owl to Athens’, referring to something that was in plentiful supply, like ‘coals to Newcastle‘. The reverse is featured on the national side of the modern Greek 1 euro coin. Drachmas were minted on different weight standards at different Greek mints. The standard that came to be most commonly used was the Athenian or Attic one, which weighed a little over 4.3 grams. After Alexander the Great‘s conquests, the name drachma was used in many of the Hellenistic kingdoms in the Middle East, including the Ptolemaickingdom in Alexandria. The Arabic unit of currency known as dirham (in the Arabic language, درهم), known from pre-Islamic times and afterwards, inherited its name from the drachma or didrachm (δίδραχμον, 2 drachmae); the dirham is still the name of the official currencies of Morocco and the United Arab Emirates. The Armenian dram also derives its name from the drachma. It is difficult to estimate comparative exchange rates with modern currency because the range of products produced by economies of centuries gone by were different from today, which makes purchasing power parity (PPP) calculations very difficult; however, some historians and economists have estimated that in the 5th century BC a drachma had a rough value of 25 U.S. dollars (in the year 1990 – equivalent to 41 USD in 2009), whereas classical historians regularly say that in the heyday of ancient Greece (the fifth and fourth centuries) the daily wage for a skilled worker or a hoplite was one drachma, and for a heliast (juror) half a drachma since 425 BC. Modern commentators derived from Xenophon that half a drachma per day (360 days per year) would provide “a comfortable subsistence” for “the poor citizens” (for the head of a household in 355 BC). Earlier in 422 BC, we also see in Aristophanes (Wasps, line 300-302) that the daily half-drachma of a juror is just enough for the daily subsistence of a family of three. A modern person might think of one drachma as the rough equivalent of a skilled worker’s daily pay in the place where they live, which could be as low as $1 USD, or as high as $100 USD, depending on the country. Minae and talents were never actually minted: they represented weight measures used for commodities (e.g. grain) as well as metals like silver or gold.